On September 15th, 2013, Aaron Alexis shot and killed 12 people at the Washington Navy Yard. As it turns out, the Navy Yard shooter was on the anti-depressant Trazodone when he committed the murders. In electronic notes he left behind, he also claimed that the government had been attacking his brain with “extremely-low frequency” electromagnetic waves for three months prior to the incident. Could it be that the instability caused by the excess serotonin in his brain from Trazodone, made him more susceptible to the ELF electromagnetic mind control? Of course. Even if there was no ELF mind-control attack and he made it up, the fact is he was on antidepressants which increase serotonin, and he killed 12 people, evidencing that excess serotonin creates mental instablility. This is not the first time we’ve had mass-shootings linked to the use of anti-depressant drugs. Almost every single school shooting that has happened in the United States has been linked to some form of psychiatric prescription drug. See Psych meds linked to 90% of school shootings. Extremely serious mistakes about the nature of the solar system didn’t matter too much until interplanetary travel became a possibility. Extremely serious mistakes about brain “transmitters” and “receptors” didn’t matter too much until the drug industry got involved. Anyone who has been reading the mass media and watching television in recent decades is familiar with the use of tryptophan as an antidepressant. Tryptophan is easily converted to serotonin and melatonin in the body. The most popular kind of antidepressant, the “serotonin reuptake inhibitor”, is said to act by increasing the action of serotonin in the brain. Many people have read articles in popular science magazines explaining that a deficiency of serotonin can cause depression, suicide, and aggression. Estrogen is often said to achieve its “wonderful” effects by increasing the effects of serotonin. Reserpine is an ancient tranquilizer, derived from a plant used in India for centuries. It has a powerful tranquilizing action, has been used to treat hypertension, and was found to be an antidepressant (Davies and Shepherd, 1955). It lowers the concentration of serotonin in the brain and other tissues. 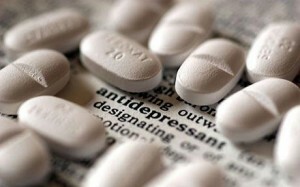 Isoniazid, an antidepressant that came into use in the 1950s, is effective, but it probably has no effect on serotonin. When those drugs were popular, serotonin wasn’t recognized as a “neurotransmitter.” It wasn’t until the 1960s that our present set of doctrines regarding serotonin’s effects on mood and behavior came into being. Serotonin research is relatively new, but it rivals estrogen research for the level of incompetence and apparent fraudulent intent that can be found in professional publications. This is partly because of the involvement of the drug industry, but the U.S. government also played a role in setting a pattern of confused and perverse interpretation of serotonin physiology, by its policy of denigrating and incriminating LSD, a powerful serotonin (approximate) antagonist, by any means possible, for example claiming that it causes genetic damage and provokes homicidal or suicidal violence. The issue of genetic damage was already disproved in the 1960s, but this was never publicly acknowledged by the National Institutes of Mental Health or other government agency. The government’s irresponsible actions helped to create the drug culture, in which health warnings about drugs were widely disregarded, because the government had been caught in blatant fraud. In more recent years, government warnings about tryptophan supplements have been widely dismissed, because the government has so often lied. Even when the public health agencies try to do something right, they fail, because they have done so much wrong. In animal studies LSD, and other anti-serotonin agents, increase playfulness and accelerate learning, and cause behavioral impairment only at very high doses. While reserpine was used medically for several decades, and was eventually found to have harmful side effects, medical research in LSD was stopped before its actual side effects could be discovered. The misrepresentations about LSD, as a powerful antiserotonin agent, allowed a set of cultural stereotypes about serotonin to be established. Misconceptions about serotonin and melatonin and tryptophan, which are metabolically interrelated, have persisted, and it seems that the drug industry has exploited these mistakes to promote the “new generation” of psychoactive drugs as activators of serotonin responses. If LSD makes people go berserk, as the government claimed, then a product to amplify the effects of serotonin should make people sane. The “serotonin reuptake inhibitors” are called the “third generation” of antidepressants. The monoamine oxidase (MAO) inhibitors, that came into use in the 1950s, are called the “first generation.” When their patents expire on a “generation” of drugs, the drug companies find reasons for claiming that the new drugs are better. Every doctor in the country seems to know that the old MAO-inhibitors are dangerous because they can raise blood pressure if you eat certain kinds of cheese while taking them. In fact, statistics show that they are safer than the new generation of antidepressants. It is hardly possible for a physician to prescribe the most appropriate drug, because the medical licensing boards are thoroughly indoctrinated by the drug companies, to believe that the safest and most effective drugs are those whose patents are still in force. While it is true that the newer antidepressants increase the actions of serotonin, it is not true that this explains their antidepressant action. This is a culturally conditioned promotional construction. Since different antidepressants increase, decrease, or don’t affect the actions of serotonin, a radically new kind of theory of depression and the antidepressants is needed. Theories based on “transmitter” substances and “receptors” are favored by the drug industry, but that kind of thinking is hardly better than the belief in demons and their exorcism. If an herbal tea cures depression because the demon doesn’t like its smell, at least the patient never has to abandon a remedy because a tea patent has expired. In the world of “neurotransmitters” and “receptors,” there is ample room for the development of speculative mechanisms of drug action. Serotonin is regulated by the rate of its synthesis and degradation, by its uptake, storage, and release, and by its transporters, and its effects are modified by a great variety of receptors, by the number of these receptors, and by their binding affinities and competitive binders. “Different receptors” are defined by the effects of chemicals other than serotonin; this means that serotonin itself hypothetically gains some of the properties of every substance that shows some binding competition with serotonin. This complexity*note 1 has made it possible to argue that a given condition is caused by either an excess or a deficiency of serotonin. To begin to understand serotonin, it’s necessary to step back from the culture of neurotransmitters, and to look at the larger biological picture. Serotonin and estrogen have many systematically interrelated functions, and women are much more likely to suffer from depression than men are. Serotonin and histamine are increased by estrogen, and their activation mimics the effects of estrogen. Serotonin is closely involved in mood disorders, but also in a great variety of other problems that affect women much more frequently than men. These are probably primarily energy disorders, relating to cellular respiration and thyroid function. Liver disease and brain disease, e.g., Alzheimer’s disease, are both much more common in women than in men, and serotonin and estrogen strongly affect the energetic processes in these organs. Liver disease can increase the brain’s exposure to serotonin, ammonia, and histamine. It isn’t just a coincidence that these three amines occur together and are neurotoxic; they are all stress-related substances, with natural roles in signaling and regulation. There are good reasons for thinking that serotonin contributes to the nerve damage seen in multiple sclerosis and Alzheimer’s disease. The high incidence of multiple sclerosis in women, and its onset during their reproductive years, is well known. The number of brain lesions is associated with the ratio of estrogen to progesterone. Estrogen activates mast cells to release histamine and serotonin, and activated mast cells can produce brain edema and demyelination. Blood clots have been microscopically associated with brain lesions like those in multiple sclerosis, and the platelets in clots release neurotoxic serotonin. In Parkinson’s disease, the benefits seen from increasing the concentration of dopamine could result from dopamine’s antagonism to serotonin; anti-serotonin drugs can alleviate the symptoms, and 5-hydroxytryptophan can worsen the symptoms (Chase, et al., 1976). Other movement disorders, including akathisia and chorea, can be produced by serotonin. In autism, repetitive motions are a common symptom, and serotonin is high in the blood serum and platelets of autistic children and their relatives. Irritable bowel syndrome, another kind of “movement disorder,” can be treated effectively with anti-serotonin agents. This syndrome is very common in women, with premenstrual exacerbations, when estrogen is highest. One of the side effects of oral contraceptives is chorea, uncontrollable dancing movements. Some research has found increased serotonin in people with Huntington’s chorea (Kish, et al., 1987), and positive results with bromocriptine have been reported (Agnoli, et al., 1977). The neurosteroid, allopregnanolone, for which progesterone is the precursor, facilitates the inhibitory action of GABA, which is known to be deficient in some disorders of mood and movement. This suggests that progesterone will be therapeutic in the movement disorders, as it is in various mood problems. Progesterone has some specific antiserotonin actions (e.g., Wu, et al., 2000). The “serotonin reuptake inhibitors” “are presumed” to have the same effect on the brain that they have on blood platelets. They inhibit the ability of platelets to retain and concentrate serotonin, allowing it to stay in the plasma. This uptake-inhibited condition is a model of the platelet behavior seen in multiple sclerosis and Alzheimer’s disease. Serotonin and its derivative, melatonin, are both involved in the biology of torpor and hibernation. Serotonin inhibits mitochondrial respiration. Excitoxic death of nerve cells involves both the limitation of energy production, and increased cellular activation. Serotonin has both of these actions. In hibernating animals, the stress of a declining food supply causes increased serotonin production. In humans and animals that don’t hibernate, the stress of winter causes very similar changes. Serotonin lowers temperature by decreasing the metabolic rate. Tryptophan and melatonin are also hypothermic. In the winter, more thyroid is needed to maintain a normal rate of metabolism. Increased serotonin interferes with the consolidation of learning. Hypothermia has a similar effect. Since estrogen increases serotonergia, and decreases body temperature, these effects help to explain the long-observed interference of estrogen with learning. Although ammonia, produced by fatigue or liver inefficiency, creates torpor, it can also cause convulsions. It synergizes with serotonin, and both of these promote excitotoxicity. Serotonin’s other names include thrombotonin, thrombocytin, enteramine, and 5-HT, its chemical name (5-hydroxytryptamine). These historical names derive from its role in the intestine and in blood vessels. In 1951, it was discovered that enteramine and thrombotonin were a single substance, and its involvement in circulatory disease, especially hypertension and vascular spasms, was the focus of research. (The increase in the number of “cardiovascular events” recently seen in the study of women using estrogen is what might be expected from something which increases serotonin dominance.) It causes vasoconstriction and vasospasm, and promotes clotting, when it’s released from platelets. Especially when it is released from mast cells, it is considered to be an inflammatory mediator, along with histamine. Edema, bronchoconstriction, immunosuppression, and joint swelling are produced by the release of serotonin from platelets or other cells. As inflammatory mediators, serotonin and histamine are directly involved in asthma, hives, gastrointestinal damage from alcohol, nerve cell damage, edema, and shock. The broadly protective effects of antihistamine drugs have been energetically exploited by the drug industry for fifty years. Why haven’t antiserotonin drugs been similarly emphasized? Research on LSD and its derivatives led to drugs such as bromocriptine, which oppose the effects of histamine and estrogen. Some of bromocriptine’s effects are clearly antagonistic to serotonin, though bromocriptine is usually called a “dopamine agonist”; dopamine is pretty generally a serotonin antagonist. Methysergide, a related drug with antiserotonin activity, is effective in protecting the brain from the effects of strokes. But there is a general disinclination to understand the broad biological meaning of these effects. I think the corrupt campaign against LSD played a large role in this: If the therapeutic value of LSD and related drugs (e.g., methysergide) with expired patents,*note2 used as antiserotonin agents, became widely known, the existing system of power and profit would be threatened. The war on drugs has always had its ulterior motives,including justifying domestic and foreign interventions in issues that have nothing to do with drugs. And in the case of the serotonin/antiserotonin mythology, this “war” has been rewarding to the drug industry–Lilly makes over $2 billion annually on Prozac. Each suicide caused by Prozac would appear to be balanced by several hundred thousand dollars earned by the corporation. If the war on drugs were serious, this would be a good place to start. And in weighing what corporate punishments might be appropriate, this corporation’s financial support for universal capital punishment should be taken into account. Many experiments have shown that estrogen is very important for aggressive behavior in animals, and estrogen promotes serotonin’s actions. Some research shows that increased serotonin is associated with certain types of increased aggressiveness, and antiserotonin agents decrease aggresiveness (Ieni, et al., 1985; McMillen, et al., 1987) but the clearest research has to do with the crucial role of serotonin in learned helplessness. Learned helplessness is a biological condition that is created by inescapable stress. In this state, animals that would normally swim for hours will stop swimming after a few minutes and allow themselves to drown. They simply don’t have enough mental or physical energy to overcome challenges. In learned helplessness, the level of serotonin is high, and an excess of serotonin helps to create the state of learned helplessness. Serotonin activates glycolysis, forming lactic acid. Excess lactic acid tends to decrease efficient energy production by interfering with mitochondrial respiration. Heart failure, hypertension, muscle hyperalgesia (Babenko, et al., 2000), some panic reactions, and other maladaptive biological events associated with problems of energy metabolism, are promoted by excessive serotonin. Autistic children and their relatives have high concentrations of serotonin in their serum and platelets. Members of a family tend to eat the same foods and to share other environmental conditions. Prenatal hypothyroidism and various kinds of imprinting, including hyperestrogenism, could account for this. Some studies have reported that thyroid supplements help autistic children, and anti-serotonin drugs have caused improvement in both children and adults. Serotonin tends to cause hypoglycemia, and hypoglycemia inhibits the conversion of thyroxine into the active T3 hormone. Hypoglycemia and hypothyroidism increase noradrenaline, and autistic people have been found to have more noradrenaline than normal. These changes, along with the general hypometabolism caused by excess serotonin, seem to justify the use of a thyroid supplement in autism and other serotonin-excess syndromes. Overdose with the serotonin reuptake inhibitors, or with 5-hydroxytryptophan, which has effects similar to serotonin, can cause the sometimes fatal “serotonin syndrome.” Symptoms can include tremors, altered consciousness, poor coordination, cardiovascular disturbances, and seizures. Treatment with anti-serotonin drugs can alleviate the symptoms and usually can prevent death. The serotonin syndrome has been reported in users of St. John’s wort as an antidepressant. Since the other large neutral amino acids compete with tryptophan for entry into cells, the branched chain amino acids have some anti-serotonin activity, and this could be a justification for their use by athletes, since tryptophan and serotonin decrease glycogen stores and reduce endurance. The only amino acid that has ever been found to be carcinogenic is tryptophan. Its ability to mimic estrogen in promoting the release of prolactin is probably responsible. A large carbohydrate meal increases the ratio of tryptophan to the competing amino acids, and it has been proposed that this can shift the body’s balance toward increased serotonin. In an animal study, bromocriptine, which shifts the balance away from serotonin, reduced obesity and insulin and free fatty acids, and improved glucose tolerance. All of these observations are easiest to understand in terms of the suppression of cellular energy. Serotonin, like estrogen, lowers cellular ATP and interferes with oxidative metabolism. Serotonin, like histamine, has its proper physiological functions, but it is a mediator of stress that has to be systematically balanced by the systems that support high energy respiratory metabolism. The use of supplements of tryptophan, hydroxytryptophan, or of the serotonin promoting antidepressant drugs, seems to be biologically inappropriate. One of the many actions of the “SSRI” (such as fluoxetine, Prozac), which aren’t related to their effect on serotonin, is to increase the concentration of allopregnanolone in the brain, imitating the action of increased progesterone. Following this discovery, Lilly got Prozac approved as a treatment for premenstrual syndrome. Since the production of allopregnanolone and progesterone depends on the availability of pregnenolone and cholesterol, a low cholesterol level would be one of the factors making this an inappropriate way to treat PMS. If we think biologically, starting with the role of serotonin as a damage-induced inflammatory mediator, we can speculate that an infinite number of irritating substances will be “serotonin reuptake inhibitors.” The particular history of the “third generation antidepressants” is one that should disturb our tranquility.